Earlier this week, Twins Daily announced the Short Season Pitcher and Hitter of the Year, and tonight we switch to the full season awards, beginning with the Relief Pitcher of the Year. In recent history, this award has been an indicator of a player making the major leagues at some point—­John Curtiss won in 2017 and also made his MLB debut, and before that Trevor Hildenberger won in 2015 and 2016 before becoming the stalwart in the bullpen he is now with the Minnesota Twins. There were several standout strikeout arms in the Twins system when it came to relief pitchers, as you will see below. Some of them have spent time in the majors this season, while a few others appear ready for their opportunity. These are the top five players to receive votes for Twins Daily’s Minor League Relief Pitcher of the Year. For a few years now, it has seemed like Jake Reed was knocking on the door to the major leagues, but in part due to some injuries, hasn’t yet made the jump. I’ll say quite frankly that he should have, at least for September of this year (and last year for that matter). The ERA to finish his season is great, but he really turned it on as the season wore on, appearing in both July and August’s Relief Pitcher of the Month entries. In that time frame Reed appeared in 16 games, pitching 26 total innings and allowing just four earned runs (1.38 ERA) on 10 hits and 10 walks (good for a 0.77 WHIP), while striking out 29. Despite appearing in 28 games with the Twins in 2017 and delivering a 1.99 ERA and 0.98 WHIP, Busenitz has been on the Triple A shuttle several times this season, never quite being able to settle in. He was excellent in the minors again in 2018, including the month of May in which he didn’t allow a single run in eight appearances and 13 total innings. He was recognized in both May and June’s Relief Pitcher of the Month awards, and in that stretch over a period of 13 MiLB appearances, did not allow a run while striking out 27 in 23 innings pitched. Stashak was a starting pitcher for the first two years of his professional career, and a decent one, after being drafted in the 13th round of the 2015 draft out of St. Johns University. But that changed in 2018, as the Twins put him in the bullpen for its entirety. He didn’t miss a beat, sustaining a sub 3.00 ERA, sub 1.10 WHIP, and sub .240 batting average against while increasing his K-rate. Stashak has always had good control, and that also didn’t leave him out of the ‘pen allowing him to have the best K/BB ratio of his career. From July through the end of the season, spanning 17 appearances and 23 innings pitched, Stashak allowed just two earned runs (0.78 ERA) on 19 hits and only 2 walks, while striking out 25. 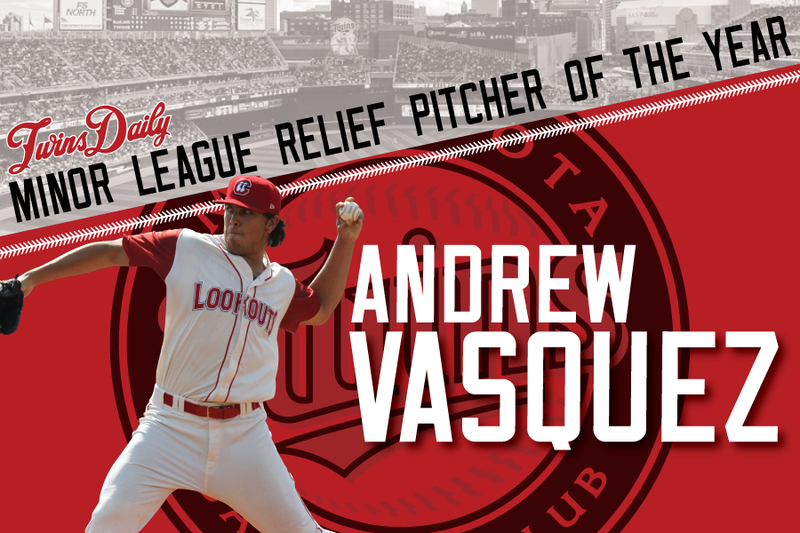 He was #2 in July’s Relief Pitcher of the Month entry and made honorable mention in two others during the season. If you paid attention during the year or have been clicking the links throughout this article, you know of the legend that is Jovani Moran already. He took home the monthly relief pitcher honors in June and July and received an honorable mention twice. The first thing you’ll notice with him is obviously the K’s. After striking out literally everybody with Elizabethton in 2017 (almost, his rate was 16.4/9IP) and taking home the Short Season Pitcher of the Year award, Moran continued that success with the Kernels and Miracle in 2018, finishing with a rate of 12.7K/9IP between his two stops. Surgery to remove bone spurs from his elbow in 2016 seemingly ended his development path as a starter, but what they’ve found as a reliever is hard to ignore. Listed at 6’1” and 170 lbs, Moran hasn’t been known for his velocity, but may have kicked it up some in the bullpen. He has also improved the movement of his secondary pitches, led by a great changeup and improving breaking ball. Moran is one to watch closely moving forward. If you thought Moran’s strikeout total was egregious, take a look at Andrew Vasquez’s. There’s a reason the left-handed Vasquez jumped from Fort Myers all the way to the Twins bullpen during the 2018 season—he has been as untouchable as his slider is elite. Like Moran, Vasquez made appearances on several of the monthly awards, including winning in August before his September callup to the majors. Leading to his recent MLB debut, Vasquez has had a standout minor league career since being drafted by the Twins in the 32nd round of the 2015 draft out of Westmont College in Santa Barbara, CA. His career minor league ERA is just 1.52 in four seasons and he has struck out 13.4/9IP. While his fastball will only touch the 90’s, as Twins farm director Jeremy Zoll noted to Twins Daily, “It’s all about the slider with Andrew.” Because of this pitch, he didn’t allow a single extra-base-hit to same-sided hitters during his 2017 season that ended with a trip to the Arizona Fall League (fun fact only I may know since I wrote about it: his first hit allowed in the AFL was a double to a lefty). His efforts during that 2017 campaign also landed him at #5 in this award category last year. You can definitely see that boost in confidence talked about in his numbers on the year. With Fort Myers, Vasquez pitched 32.2 innings with a 1.38 ERA, 1.13 WHIP, and 37:13 K to BB ratio. With the Lookouts, those numbers improved to 31.0 innings with a 1.16 ERA, 0.81 WHIP, and a 59:4 K to BB ratio. Then, before he was called up to the Twins he made four appearances with the Rochester Red Wings, pitching 5.2 innings and striking out 12 of the 28 hitters he faced (42.3%). It was an easy decision to add Vasquez to the 40-man when rosters expanded for September based on his numbers and the fact that he would have to be protected in the offseason anyway. Twins fans should be able to see that slider plenty of times over the final month and get an idea of what the future could hold for the 6’6” left-hander. Definitely look into that, Mr. Zoll! Congratulations to Andrew Vasquez and the rest of the relievers recognized by Twins Daily for their efforts in 2018. Vasquez has the ingredients to stick around for a while, even if it’s just to devastate left-handed hitters. What do you think? How would your ballot look? Nice season for Vasquez. Really interested in Moran. Always looking for dominant bullpen arms.Here's to hoping we have a couple. What a year for Vasquez.Can he become that special short man like the Indian's Miller? Have been on the Moran bandwagon for over a year.My question for November is who of the rule 5 eligible group will be left off the roster?Seems they won't have the space to add all the guys at risk of being lost.Will it be Reed?Anderson?Jay?Wade? Was a bit surprised looking at the ERA's of the 'Other' group.All, except Moya, were in the mid 3's.And I don't know what to think about Busenitz.Very good at Rochester with some really ugly outings when with the Twins? What does Jake Reed have to do to get called up? Not much disagreement on who the top relievers were for the twins minor league system this year! Think Vasquez will be able to still utilize the fastball in MLB at that velocity because of the angle he can get at 6'6"? If he's got a wipeout slider and an effective enough fastball, he should be fine. I wish the Twins would give him some longer outings in games that are clearly lost. This is the time to see what he can do with a little time in the game to calm down. I think he was just so shocked to get called up it threw him for a loop! Miller is upper-90s. Vasquez tops out at 91, maybe 92. But he can be a really good lefty reliever. The 40-man givens are Wade and Gordon. I'd like to think Reed and Anderson might be too. With Roger and Moya and now Vasquez, I wouldd think that Jay would be left unprotected. Why did Anderson not make the top 5? Is it simply ERA? I hope they add Anderson and Reed to the 40-man roster -- especially Anderson. I tend to agree. He's always had strong ground ball rates as well. Again, Andrew Vasquez has a career minor league ERA of 1.52 and K/9 of 13.44.Statistically he dominated at Ft Myers with a 1.51 ERA and 52 strikeouts in 35 innings. So what does our "brain trust" do with Vasquez?Send him back to A+ of course.Now Vasquez does not have the most powerful stuff, and I saw him (and Lewis Thorpe) have a very bad outing last year, but why keep a 24 year old pitcher at the same level after he has such performances? Seriously.What is wrong with the Twins system that they continuously make these decisions?It would be different if he was younger, 21 years of age or that htey wanted him to convert to a starter or they wanted him to learn a new pitch.But that isn't the case. After "re-dominating" Ft Myers and having even better statistics in AA (1.16 ERA17.1K/9) and then continued this success to AAA (1.59 ERA18.9K) he gets "rushed" to the major league level in September. Vasquez should have started in AA this season and then when the idea that they needed David Hale, Oliver Drake, or Matt Belisle went through their heads should have been recalled to the big leagues instead.That is 36 additional appearances that Vasquez could have been used, and most likely performed better than any of those 30+ year old mediocrities that have no chance of being part of the future of this team. How anyone can explain this with any rationality is beyond me. The FO continues to baffle me.Why not Reed - was it so important that Belisle continue to have innings?? The promotions and development of minor league arms continues to be a questionable attribute of the Twins.Anderson should have been up too.I would have brought all of these up!Get young arms in the BP and let them develop. Like I said in the above, it just does not make sense.One "critic" of mine talked about the "valuable 40 man roster spots they have", yet the Twins have populated those spots with guys like Bobby Wilson, Taylor Motter, and Matt Belisle. In the September call up last season Luke Bard and Nick Burdi should have been called up.This season Reed for sure, Anderson probably.They have roster spots for Belisle and other other team rejects. It's pretty minor and he got to the big leagues, making it even more minor. Every year, teams bring in new players, free agents, minor league free agents, etc., so the dominoes fall because no one wants to lose more players than they have to. So it becomes a numbers game. It takes care of itself. Vasquez kept putting up numbers. The Twins traded lefty Anthony McIver. Mason Melotakis asked for his release. Injuries happen. And again, it all works itself out. Why would they have called up Burdi last September? He was only like 3 months post Tommy John surgery. While I agree with Reed (should have been called up), if he's added to the 40-man roster in November, it really isn't a big deal. Pitch much worse and change his last name to Belisle? I left it out, but Zoll did imply that Vasquez was not in double-A to start the year because of roster crunches there and in Rochester. I had these same feelings too, especially after he performed well in the AFL. Here's a question for Seth, Steve or others.It is likely the Twins will keep two lefty relievers on opening day next year.One will be Taylor Rodgers.If they have to choose between Moya and Vasquez, who do they pick? Moya has more experience.Will he be the better choice on April 1?But does Vasquez have a higher ceiling?Curious what you think. I'm not who you were asking for an opinion, but I'll mention that when I took a look at the two pitchers, I was surprised to notice that Vasquez is actually the older of the two, by more than a year. Both have minor league options remaining, so that won't dictate much of anything either. Moya might have a little more room for growth while Vasquez might be close to "what you see is what you get" - that's an awfully fine distinction regarding a little more than a year's difference in age, but it's the reverse of what I had thought to be the case. In his short time in the majors, Vasquez has actually done more poorly against lefty batters than righties. It's still ultra-small sample size, but that could make the decision for management moreso than other procedural considerations if they want lefty arms for LOOGY purposes. At AAA he's been very good against lefties, of course.